Kickstarter An insight into how the course flows. Kickstart your learning program by reading a passage and answering a set of 10 questions. Newbie Learn to speak & write grammatically correct english with an insight into Articles, Prepositions, Tenses, Singular-Plural & Subject-Predicate. Explorer Explore & learn to make day-to-day conversations in English by going through some common topics like 'Trees', 'Shopping Malls', 'Who wants to be a millionaire' etc. Expert Learn to construct simple sentences in English and become an expert by practicing them by going through interesting topics like 'IPL & Money', 'Online Shopping', 'Google' etc. 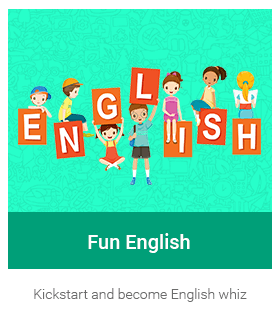 Whiz Master English by learning to use common phrases, vocabulary and fun facts. Learn to write and speak clear and simple sentences with the help of passages that you are familiar with, like 'WhatsApp', 'Facebook', 'Bollywood remixes' etc. Copyright © 2017 iPRIMED Education Solutions Pvt Ltd. All Rights Reserved.